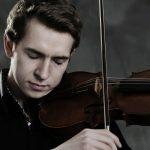 Violinist Emmanuel Borowsky has toured 35 countries in North America, Europe, Asia, and the Middle East. As one critic wrote: “He brought forth a celebration of fire and temperament, as well as immense sensitivity, wonderfully flowing chants and a pliant tone. He is a remarkable talent.” Mr. Borowsky has performed as soloist with orchestras across the globe and has released eight CDs, including one with a collection of original compositions. He teaches violin and chamber music at the Intermuse International Music Institute and Festival USA and also teaches privately in Baltimore. Mr. Borowsky holds degrees from the Icelandic Academy of the Arts and Indiana University. He is currently completing a Doctorate of Musical Arts at the University of Maryland. His teachers have included Dorothy DeLay, Roman Totenberg, and James Stern. Mr. Borowsky particularly enjoys assisting string players in finding their dream instrument through his services as The Violin Finder.